The Swift Escape 694, four berth motorhome is ideal for a couple wanting extra space and a large walk round bed. 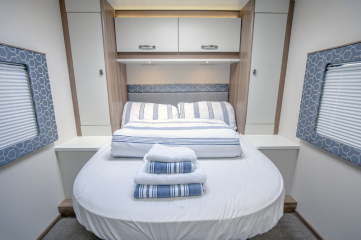 Has two belted seats in the rear with the availability to make the dining area into another double bed which in our opinion is suitable for occasional use by children, the Skye is 7.4 metres long and has a large lounge area for relaxing in the evening. Rear bedroom fully fitted L shaped kitchen. Fitted with a six-speed gearbox coupled to a powerful 2.3 litre turbo diesel engine, this motorhome achieves between 28 to 32 miles per gallon, fitted with colour reverse camera, 4 metre awning, Wi-Fi system, air con, bike rack and many other extras, grade 3 insulation classification means this motorhome is fully winterised for sub-zero temperatures. Captain style seats that swivel round in the cab area gives the Swift Escape 694, motorhome a very large lounge area, there are a further two belted seats in the rear which a forward facing, the lounge will comfortably accommodate 4 adults with ease. The lounge can be converted to an L shape for more seating. The Skye is also fitted with an auto - roam satellite Tv receiver, with a 19” flat screen TV with a built in DVD player. The lounge table is a fixed telescopic table which can swivel round in any direction with a sliding flip over leaf for extra space allowing the table to be moved out of the way when not in use. An opening sunroof in the lounge lets in light, oak effect high impact and scratch resistant flooring with carpets available throughout. One of the main features of the Swift Escape 694, is the rear bedroom with a full size walk round bed which is fitted with a luxury duvalay mattress, The bedroom is fitted with a divider so this area can be closed off for privacy, his and hers wardrobes each side of the bed , with ample over head lockers for storage, extra storage is available under the bed which lifts up on gas struts, the main double bed measures 1.83m x 1.33m which is .. 6 ft x 4.4”. The lounge area can be made up into another double and measures 1.39m x 1.39. 6 ft 10” x .3.5” . The Swift Escape 694 has a fully fitted L shaped kitchen, with a 3 burner gas hob, combined gas oven and grill with electronic ignition, large storage area under the moulded granite effect sink, with two large drawers mean ample storage for pots , pans groceries etc, large slimline 138 litre dometic fridge with freezer compartment, fold away worktop extension gives extra work top space. 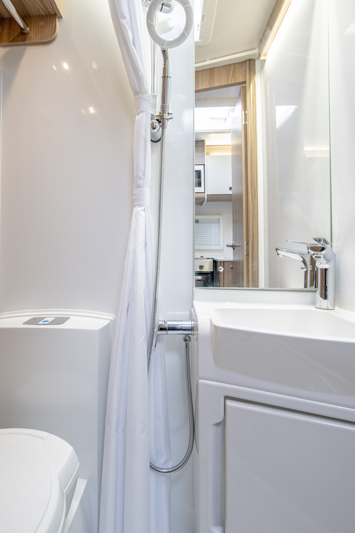 This is probably the compromise in the Swift Escape 694, motorhome, in order to have a large lounge and bedroom in a 7.5 metre long motorhome the washroom is compact , however it has everything you would expect and is very useable, thetford swivel cassette toilet with electric flush, full power shower, towel storage locker, fixed sink with mixer tap , vanity mirror, lower storage cupboard, LED downlighters,100 litre internal fresh water tank, 90 litre waste tank. New Swift command 7” screen touch control panel allows easy access to controlling all the electrical functions, with a downloadable app which allows you to control and check all the vans functions remotely from your mobile phone, ultralow energy lighting with ambient strip lighting above the overhead lockers, LED spotlights, LED reading lights fitted to the cab area, four 240 sockets, two USB ports , 2 x 12v sockets, heating and hot water in the Swift Escape 694, is supplied by a Truma combi boiler which runs from mains electric or from gas, although gas is the most efficient for quick set up. The interface control panel is fully programable allowing a multitude of settings.